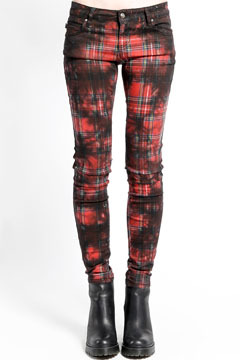 Tripp NYC Living Art womens t-back five pocket stretch premium skinny jeans features an all over red black and white tartan plaid pattern that creates an edgy look. The back pockets feature signature letter T design in the center. Plenty of stretch for comfortable fit. Skull rivets, zipper fly, button closure. Due to hand treatment process, color may vary slightly. 97% Cotton 3% Spandex. Care: Hand wash cold, dry flat. Color: red plaid black tie dye. Tripp NYC t-back skinny jeans also available in other colors (sold separately). Tripp NYC is a exclusively handcrafted designer brand. A favorite among musicians, artists and celebrities.